Stephen Charrier, President of Rollerblade USA, and Rob Gill, of InlineSkates.com, review the 2015 Rollerblade Macroblade 84 ALU Mens and Womens Inline Skates. 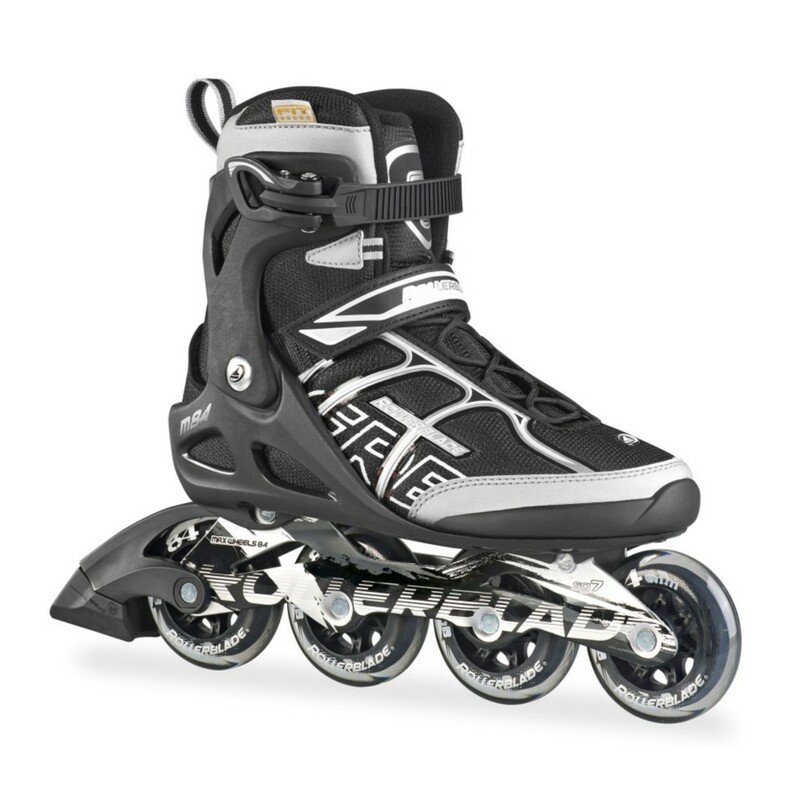 Really cool skate in the Rollerblade lineup - the Macroblade 84. Really moving into that performance type series in Rollerblade's lineup. It is, Rob. The Macroblade series is a number of skates: the 84, 90 and 100. These skates, we've just hit the perfect balance of performance and skating position. Some things that are hard to understand just looking at a skate, I can tell you the way this skate performs and all, it's really exceed our expectations. For sure, and then the 84 in the name of the skate refers to the wheel size. It does, yes. So, 84mm wheels here. Yep. So, we have an 84mm wheel with an SG7 bearing so it's going to have a nice ride. This is, I guess the entry point to where you have a real performance skate. Totally. Without getting some people have a tough time when you move into those 90 and 100mm wheels. Raising that center of gravity a little bit too so getting a nice roll and a nice speed without going with a real large wheel. Exactly. The larger wheels, I think the biggest benefit is it smooths out your ride, so an 84 millimeter wheel is going to give you a smoother ride, be performance based, it's going to work well for you. Really nice performance - Aluminum frame on this skate. This is a skate that's really going to get out and skate. You can do miles on it. For sure. And then the fit of this skate is incredible. Yeah, it has an upgraded liner to it. The Form Fit Liner is going to hold your foot really nicely. Just overall performance, this is a really nice, mid-priced fitness skate that's going to work for people looking for that kind of 84mm size experience. For sure, and then an aluminum frame on this skate too. Yeah, aluminum frame on there too. Just overall a nice performance. This is the women's color here. You're holding the men's there. So, who would you gear this skate towards? You know, this could be for a lot of different skaters. This is a skate that will be able to skate some distances so you can buy this if you're planning on training, you know, 5-10 miles on different intervals during the week. For someone who's just getting started skating, it's not too big of a wheel or prohibitive so it's a pretty universal product, will fit a lot of different people. Perfect. Well, there you have it. Thank you for joining us on the Daily Spin and you can check out the Macroblade 84 men's and women's skates on inlineskates.com.